If you’ve been using beacons for a while, you probably know that iBeacon profile and Android devices don’t really go together. Given that nearly 80% of mobile users worldwide use Android devices, this makes IoT with beacons challenging. That’s the biggest thing that has changed since Eddystone launched. Google’s new format supports both iOS and Android, so you can engage with a lot more smart device users. No matter whether you’re using beacons indoors or in tough conditions, whatever your use case is you can deliver it to both mobile OS’ users, significantly increasing your app’s reach and the ROI of proximity in your app. Eddystone lets you broadcast URLs that show up on devices that don’t have your app installed. 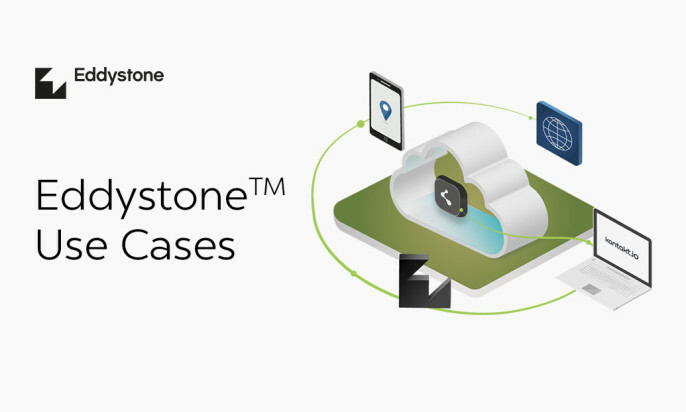 Unlike other beacon manufacturers’ hardware, our beacons can broadcast both frame types—Eddystone-UID (connected to specific apps) and Eddystone-URL (broadcasting these web addresses)—one after the other. That gives you a new tool to encourage your visitors to download your app as they’re on site. Say you’re a museum and you’ve developed a proximity-driven mobile audio guide. You can use Eddystone to present your visitors with a link to your app on App Store or Google Play and encourage them to download it. And then once they’ve done so, the beacon will also broadcast a UID for the app to use. Using Eddystone-URL you can link to any page of your choice so you can power up your business with proximity even if you don’t have your own app! Since 84% of smartphone shoppers use their devices to help them shop while in a store, you can finally reach them and provide with the content they expect. For example, if you’re a restaurant, you may send a link to your online menu that shows up once someone enters your venue. Or, being a retailer, you may feature your current promotions, or display coupons when a mobile user is nearby. The third frame type that Eddystone broadcasts is Eddystone-TLM (Telemetry). It’s sensor-driven data on the beacon’s state and, possibly in the future, the environment around it. You could use that data to control temperature and humidity in your warehouse. Or, if using Tough Beacons, to do the same with moving objects like machines and valuable packages. Telemetry would also enable you to trigger different actions based on various conditions. Therefore, depending on the weather, you could push notifications and invite passers-by to come by and have a cold drink or a cup of warming tea. As a hotel, you’d use that feature to automatically adjust temperature in rooms, based on conditions and particular guests’ preferences. How do you like these ideas? What would you add to our proposals? Which Eddystone feature excites you the most? Let us know in the comments section! If you’re still hungry for use cases, or want to know more about the ones above, join over 200 other inquiring marketers and entrepreneurs, and let’s talk during the upcoming webinar! Great article! I love that Eddystone beacons are making this technology widely available. One thing I’m not quite understanding yet (but am very excited about) are the businesses that do not have an app. How does that work? Do customers need to be on the specific page on their mobile phone in order to get the beacon triggered message? Thanks! That’s about google play 7.8, but what about Apple? Does this feature avaliable on iOS? Chrome Browser for iOS already supports Eddystone-URL. You may read more about it here: http://kntk.io/sw (under the section entitled: “How does Eddystone deliver URLs to users? Does a user have to open a browser in order to see something?”). Let me know if that answers your question. I am fascinated. My mind is flying through small structures that become ideas, by connecting to create large projects. The beacons are the key. Hi, I notice that all comments are posted months ago. I wonder if beacons in general (apple&google) are disapering from the market. If they´re not, I’d like to know some success cases. Please comment. Turning the “Bluetooth ON” is the major drawbrack from eddystone. Can Anyone share your ideas how this can be overcomed effectively?